Animal Sounds NW provides comprehensive abdominal, echocardiographic and small parts ultrasound exams. We currently use the state of the art General Electric Logiq e vet system with the latest software and four different transducers – a system that can accommodate all scanning possibilities. Shave the appropriate areas prior to the scheduled appointment time (after receiving owner permission). Please see images to the right or you can wait for us to arrive to shave if unsure of shave margins. Patient comfort and reduced anxiety with sedation administration, especially for abdominal studies, will give the best diagnostic yield. If FNA is requested, sedation or anesthesia is very important. Administration of any drugs and monitoring of the patient are the responsibilities of the requesting rDVM. Because this is a mobile service and appointments may vary due to emergencies, cancellations, add-on cases, etc., it would be helpful if the pet is dropped off earlier than the scheduled appointment time. If there are cancellations, we will call to check if the appointment can be moved up. If you would like to add an appointment, adding on a patient is usually no problem but please call us beforehand to verify an additional appointment. A veterinary technician or assistant will be needed to hold the pet during the exam. 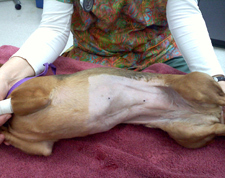 Also, if sedation or anesthesia is used, monitoring by a veterinary technician should be provided. The exam usually takes 20-30 minutes for a single cavity. Once completed, the image set along with supplemental documents are uploaded to SonoPath.com Boarded specialists from radiology, internal medicine, cardiology and ABVP are available for interpretation depending on the type of report requested. Turn-around time is 24 hours or less for routine reports. A STAT interpretation service is available for an additional fee. Owner attendance for any ultrasound exam is not permitted due to liability issues. 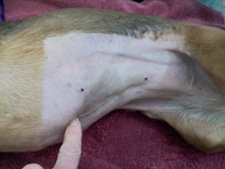 Feel for xyphoid, shave laterally both sides (including on top of ribs), down to hip/pubis. The pet is scanned in lateral recumbency. Feel for heart beat, shave a 2-4 inch square around it, going to sternum. Please do both right and left sides. For cats, shave 2-3 inches from one side to the other, making a "saddle" across the sternum.